Surrounded by miles of mangrove islands and open water, Marco Island is the ideal family resort and pristine getaway spot combined into one. From the comfort of Marco Island condo rentals, you can plan a day at the sandy beach or enjoy the island's many activities and attractions. Marco Island's climate is mild any time of the year, but it's pleasant wintertime weather makes it perfect for escaping the cold. 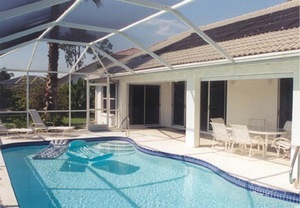 Marco Island rentals are the best choice for enjoying it all away from the crowds. A wonderful day on Marco Island can be had by just sitting casually on the beach, taking in the scene of the white sand and calm and pretty Gulf of Mexico. Beach goers can find absolute satisfaction with the island's shoreline. For the more adventurous, boat rides and eco-tours are available on the Gulf as well as among the many small islands and backwaters. Airboat rides provide for fast paced adventures the whole family can enjoy, and sightings of manatees and dolphins are always a possibility. The landscape will seem like a distant world but so close to home, and the Marco Island resort experience is like no other coastal vacation area. Marco Island vacation rentals will feel like home, with amenities that outrank any hotel or motel at a rate manageable for the family vacation budget. Walking the shoreline and collecting shells is the ideal exploratory experience. The beach and the sand bars at low tide are the best places to do so. Off-beach adventures include a hike at the Rookery Bay Reserve, or you can look for birds such as ospreys, spoonbills, and terns. If golf is your thing, Marco Island is the right place to be, with many golf courses to suit the needs of vacationing golfers. Everyone in the family can find something to do, and meet up back at Marco Island rentals for dinner. You can cook a meal in the kitchen or heat up leftovers from the day before. That's not something you can do at a hotel or motel. Take a fishing trip, or visit an art gallery or browse shops if you want to stay on land. There are also different kinds of restaurants to suit your dining needs and seafood delicacies that will make your mouth water. Marco Island condo rentals are close to it all, so you can be pampered by the convenience of staying at a spacious accommodation never far from your destination. Families with children can have a stress-free time just taking it easy or exploring nature like they never have before. Take your pick of Marco Island vacation rentals and speak with an owner about what type of comfort is best for you. Marco Island rentals are tailored to any family vacation budget and afford a completely alternative experience to staying at the typical motel or hotel room. The experience is something everyone will build fond memories of and will talk about for a long time to come. Check out nearby Ave Maria , Bonita Springs , Captiva , Captiva Island , Estero , Ft Myers , Ft Myers Beach , Naples , North Captiva Island , Sanibel , Sanibel Island .